Jenny Wong (BSc, MSc, PhD) is a Director of Wild Resources Limited. 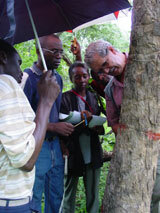 She has worked in tropical forestry specialising in inventory since 1988. Over the past ten years her work has broadened to include inventory of all wild products derived from forests and European forestry. She has a mix of field and academic experience and is uniquely placed to bridge the gap between research and practice. She holds an honorary Lectureship at the School of Environment and Natural Resources, Bangor University. Bryan Dickinson (BSc, MPhil) is a Director of Wild Resources Limited. He trained as a wildlife ecologist and has experience in wildlife surveying and conservation management in tropical forests since 1988. He has worked with international conservation bodies and local non-governmental organisations, carrying out research, resource surveys, and monitoring of protected sites.